Home » ★★☆☆☆ » Signor Sassi. Dinosaur spotted in Knightsbridge. Signor Sassi. Dinosaur spotted in Knightsbridge. It is Friday morning at 10 am. I text my client, G, as we are meant to be meeting for lunch on the Monday and nothing has been booked yet. Where are we eating and are you booking something? I am worried that we are leaving it too late. I am married to the wrong woman, he says, when calling me, post text, to discuss negotiate the venue. I suggest Palomar – I need to go back. No, he says, I don’t fancy. Okay then, how about Fischer’s, I say, thinking that he might really like that, even though I have been more times than is credible. Again with the no. Okay I say, I give up. If we were married, what follows is a sentence which would never leave my mouth. You choose, I say. G’s tastes run to the traditional, and he suggests Scalini. No, I say, pushing my luck, I don’t fancy. What about Signor Sassi, he says and I can feel that his patience is wearing thin. I confess that I have never heard of it. Never heard of it, he says? That’s it then. I’ll book it. 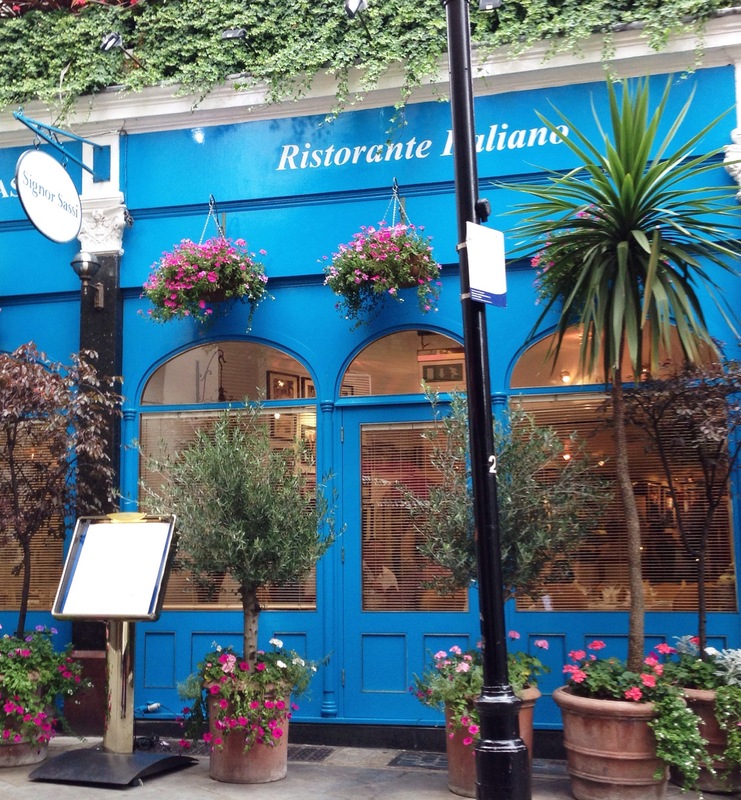 Down a little alleyway, at the side of the Bulgari Hotel sits Signor Sassi. According to its website, it opened in 1984 and has become “one of the most famous Italian restaurants in London.” It goes on: “Over the years it has become famous for its original simple Italian food and the atmosphere that is talked about around the world.” Apparently frequented by sports stars, actors and royalty, it is (it says) the jewel in the crown of Italian restaurants. The copywriter has clearly been briefed by a fantasist. I have no doubt from the décor that it did indeed open in 1984. And that it hasn’t changed since. Marble floors and walls, coloured inlays, tinted mirrors and celebrity photos adorning every wall not covered by a mirror, this a piece of social history. Look kids, this is how restaurants looked in the 1980s. I was a little overwhelmed by the vast menu of “original simple Italian food” and was confused by the fact that there were two menus, which appeared to be fairly similar. There was no explanation. I discovered later that one of them was a two page menu of “daily specials”. I wonder when that last changed. Or if it ever has. And it’s a waiters in formal clothing sort of place, where they bring some parmesan to the table, with a bowl of olives to eat whilst you peruse the menu. I kept eating the parmesan, in the hope that by putting more and more into my mouth I might be able to actually taste it. And the bread was unmemorable. I left some. When faced with enormo-menu syndrome, I always go for simple. Here, Parma ham and melon. 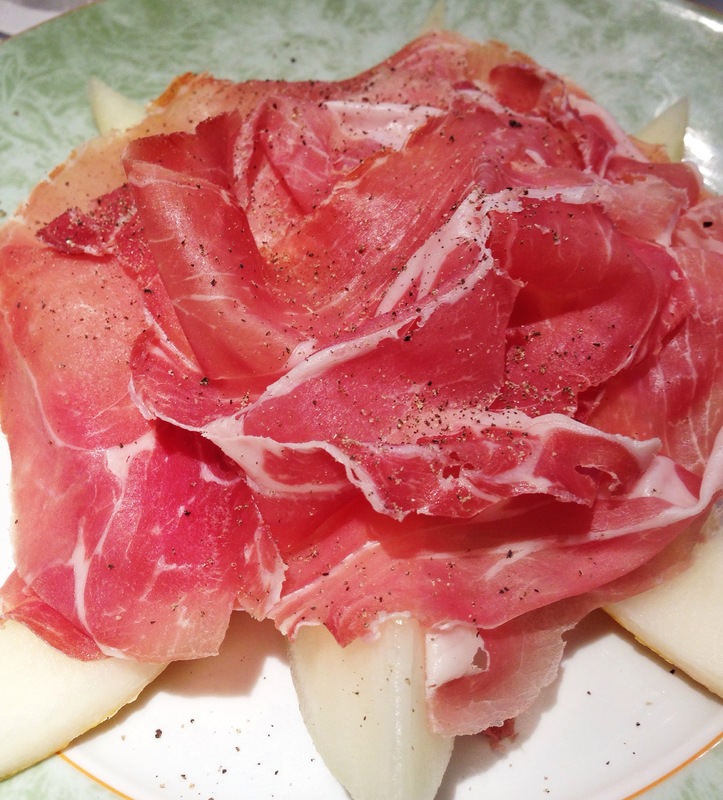 The ham was fine, soft and delicate, draped over the not particularly sweet melon. Not the most adventurous of dishes, I grant, but adequate. G was quite happy with his crab salad. We had debated over the main course. I had tried to lead him away from the Dover sole, towards the spaghetti lobster, which is what he really wanted. He resisted. Thus I felt it necessary to order the lobster, so that I could let him have some of mine. It’s part of the all-round service G expects from his lawyer. 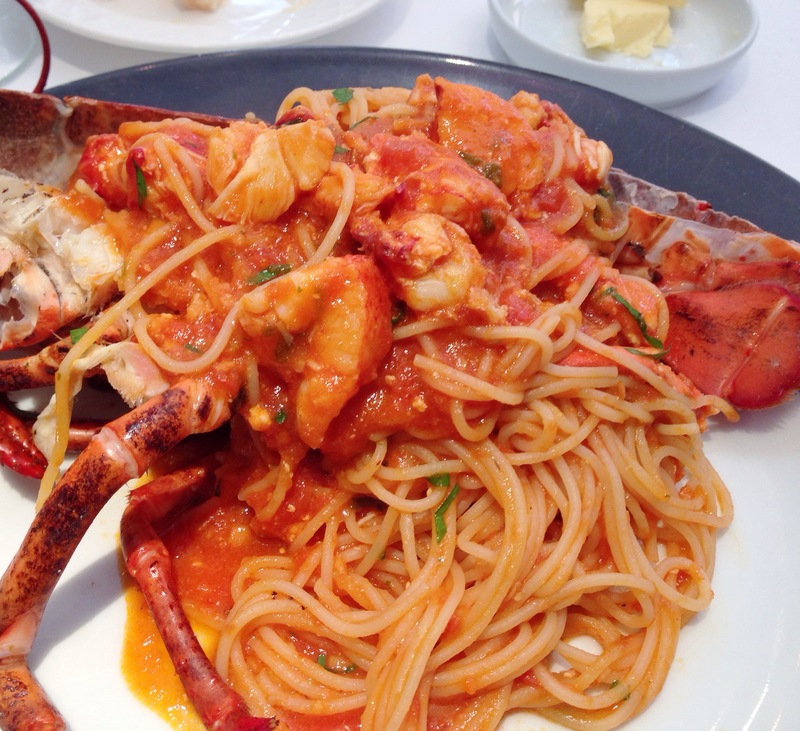 The spaghetti lobster is described as Signor Sassi’s most famous dish. Served on a lobster shell, this was slightly overcooked pasta with lobster pieces in a tomato sauce. Perfectly acceptable but Signor Sassi’s most famous dish? Where, exactly? Perhaps it is talked about all over the world like the restaurant itself. And it’s not as if it wasn’t full. Nearby, a large table of Arab women all having a great time. Next door, a man with back-combed hair wearing a shirt which was white at the front and patterned all over the back, accompanied by a plastic-faced companion. A table of footballers a bit further down. Truly a reflection of the local area. I know that this restaurant has its admirers but I’m not sure what it is that they love. There are restaurants which survive on reputation and history, restaurants with atmosphere and charm, where the food is secondary. In pitching itself as the jewel in the crown of Italian restaurants it clearly sees itself as something special, but truly, I can’t see what makes this so popular. The waiters sporadically bursting into song? The unchallenging menu? The old-fashioned feel? It certainly can’t be the food. It’s good enough, but world famous? Not in my world. That spaghetti looks…well, I don’t like the way it’s eyeing me up with a hint of come hither Heinz. Oh, dear, I remember this place so well. In the ’90s I worked with a larger than life American (our offices were next to Pizza on the Park) who adored this restaurant. He was a genuinely lovely guy, and great company, but unfortunately, he would only ever drink one kind of wine – Pinot Grigio. Whatever anybody else was eating, Pinot Grigio it was. Have never been able to drink it since.